A woman travels to her Vermont hometown to save her family's Christmas tree farm from foreclosure. Man inherited a company that has a toy factory in a small town. The town needs the factory to stay open. He goes to decide to keep or close the factory. Finds the meaning of Christmas along the way. Maggie is thrilled when Mitch, her long time crush, moves back to town. When she learns Mitch's love for Christmas has drastically changed, she tries to bring his holiday spirits back by showing him the magic of Christmas. With two more weeks until Christmas, a busy business man, Marc Rehnquist, hires a struggling artist, Anna Parisi, to help him pick out gifts for his friends and family. 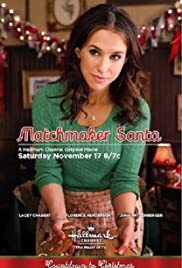 Q: Where was Matchmaker Santa's Buford Falls scenes filmed? Does anyone know? I suppose I should confess I am a true hopeless romantic. I love most all Hallmark Christmas movies, but even with that said I still have my favorites. I will also add that I don't always feel the chemistry is there between the actors. When it is, when that magic is there, it makes them so much more enjoyable. I loved this one for that reason. I thought the actors all interacted well. This movie has my favorite Santa (he's played Santa in a few Hallmark movies)so I am sure that helped. Lacey Chabert does tend to be one of my favorites. She is such a believable character and everything I see her in. This is my current favorite Hallmark movie, and quite honestly in a world where things are a bit chaotic and full of bad news, movies like this are exactly what I need to restore my faith. I love the old fashioned traditions of making cookies, going to a tree lighting, and just overall feeling like love still exist. The world just needs more of it.